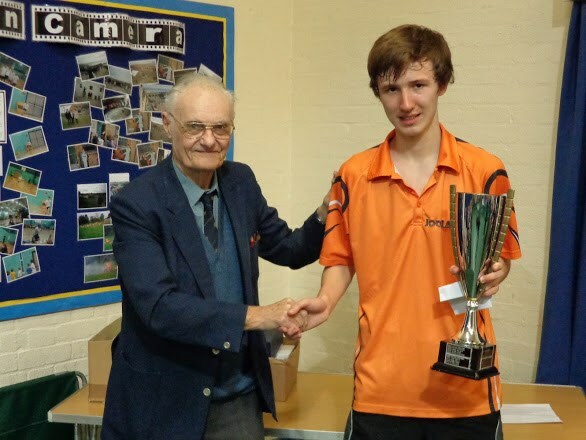 Daniel Barna, a leading player in the Horsham & Crawley League and still a junior, overcame Peter Bartram, the Sussex Veterans’ first team captain, in a four set thriller 13-11, 6-11, 11-6, 12-10 to take the Invitation Cup. 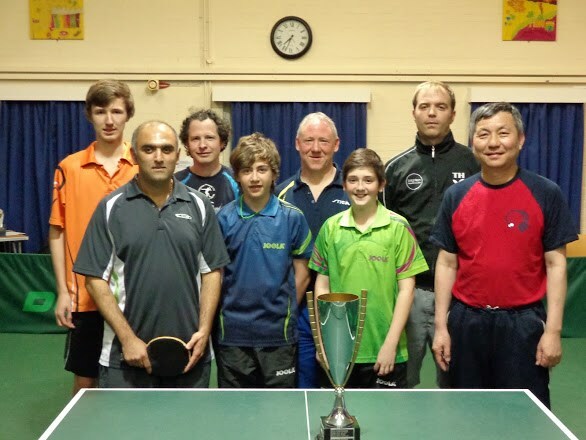 It was a fitting climax to an evening of top class table tennis enjoyed by close to seventy spectators at the Lancing Table Tennis Club on the 25th April. Eight invited players took part in the event which was run on a knockout basis. In the quarter finals Barna beat Jack Bennett, a top 20 ranked England junior player, 11-5, 11-8, 9-11, 11-9, progressing to the semi where he was matched against Tim Holtam. Holtam had come through his quarter final match against Prakash Varsani in straight sets 11-4, 11-8, 11-6. The semi-final went to five sets with Barna coming back from 2-1 down to beat Holtam 11-5 in the fifth. Bartram beat young Josh Bennett in his quarter final 6-11, 11-7, 11-6, 11-7, and then met Wen Wei Xu in the semi. Xu had beaten Rory Scott easily in his quarter final 11-8, 11-3, 11-3. The Bartram Xu semi-final could have gone to a deciding set, but Bartram came through in four sets 11-5, 11-7, 6-11, 13-11. The evening also saw the presentation of league trophies. The Woodlands club took most of the honours with their “A” team finishing runners up in Div.1, “C” & “D” teams finishing first and second in Div.2, and their “G” team finishing runners up in Div.3. The winners of Div.1 were Goring “A”, and West Worthing won Div.3. The Jim Holden Trophy, for the most improved junior player, went to Lim Tang of Lancing F.
Daniel Barna receiving congratulations from Peter Wales (President of the W&DTTA) who presented the cup. The players who took part in the tournament. Left to right: Daniel Barna, Prakash Varsani, Rory Scott, Jack Bennett, Peter Bartram, Josh Bennett, Tim Holtam, Wen Wei Xu.